MR. COUGHLAN: This opening statement will endeavour to give an indication of the matters with which the Tribunal intends to deal at its public sittings commencing today. It is envisaged that these sittings will be held over the next week or so when they will adjourn for a period of three weeks and will then be resumed for several weeks. The likely duration of the resumed sittings cannot be predicted at this stage. The Tribunal proposes to divide the work to be dealt with at these sittings into three stages. At the first stage it will deal with a carry over of material from its last sittings and with one or two novel matters. Both the carry over and the new material at this first stage will concern those Terms of Reference which pertain to Mr. Charles Haughey. At the second stage, on the resumption after the break which will last about three weeks, the Tribunal will pass on to those Terms of Reference which pertain to other holders of public office, including, mainly, Mr. Michael Lowry. In this connection, I should mention that to date the Tribunal has proceeded on the basis that the expression “holder of public office” meant a holder of ministerial office, that is to say the holder of office as a member of the government. In promulgating its interpretation of its Terms of Reference on the 24th day of September, 1998, the Tribunal made it clear that this interpretation was subject to revision as the work of the Tribunal progressed and as more information came to hand. Having considered the position in the light of information now to hand and coming to hand as a result of the Tribunal’s continued private investigations, it may be necessary to promulgate a revised interpretation of the Tribunal’s Terms of Reference. When the Tribunal comes to deal with the second stage of its work, a comprehensive outline statement will be made dealing in some detail with the material to be referred to and with any related revision of the Terms of Reference. It would be both unfair and unnecessary to allude to these matters in detail at this point. This is because it would be inappropriate to refer in any detail to individuals who may be affected by or be involved in those public sittings when there would be a substantial gap between any public references to the material and any opportunity, any such individual might have to respond either by seeking to examine witnesses or to give evidence. The third stage of the Tribunal’s work will involve a return to those parts of the Terms of Reference which pertain mainly to Mr. Charles Haughey. It will not however, be concerned exclusively with Mr. Haughey. What is envisaged is that in the third stage the Tribunal’s work will involve scrutinising in some detail the various accounts of Mr. Charles Haughey with Guinness & Mahon Bank, that is to say accounts in his own name, accounts he may have held jointly with other persons, and also with the Amiens accounts, insofar as those accounts affected him. The third stage will also deal with a number of other accounts which, from the evidence to date, appear to have involved the holding of funds on behalf of, or the making of payments on behalf of Mr. Charles Haughey. They include the Kentford Account with Bank of Ireland. The Tribunal will also examine in greater detail the Ansbacher accounts and the memorandum accounts. Dealing now with the first of the three stages proposed by the Tribunal; the Tribunal has already indicated how it came to be interested in Allied Irish Banks: that this stemmed from the fact that inquiries carried out by the Tribunal had shown that in 1979/80 £750,000 was lodged to Mr. Haughey’s account in Allied Irish Banks to clear up a long standing indebtedness. Evidence was given which indicated that this indebtedness was in the region of in excess of £1.14 million in or about the month of December 1979, and that as a result of a compromise agreement with Allied Irish Banks, Mr. Haughey was able to sever his relationship with that bank for a payment amounting to what would appear to be substantially less than the full amount due.The Tribunal has already in the course of its public sittings scrutinised some of the circumstances in which, what appears to be a very substantial indebtedness, was settled. Allied Irish Banks has asserted, and evidence has been given by officials of the bank asserting that the compromise was one which was commercially justified having regard to the protracted and difficult history of Mr. Haughey’s relationship with the bank. Evidence was also given by some of the bank’s directors. At the time of the adjournment of the Tribunal’s last public sittings it hadn’t proved possible to take the evidence of a number of directors of the bank who were involved in its affairs at the material time, that is to say in 1979, early 1980. Evidence will now be given by a number of other Directors of the bank. From the information made available to the Tribunal by some of those directors, it would appear that they had no involvement in or prior knowledge of any settlement. The Tribunal has been furnished with a statement on behalf of Mr. Patrick O’Keeffe, the then Deputy Chief Executive of Allied Irish Banks. It would appear from the statement that Mr. O’Keeffe, both as a director of the bank and as Deputy Chief Executive was, together with Mr. Niall Crowley, the then Chairman of the bank, aware of the settlement, and from Mr. O’Keeffe’s statement it is clear that he was directly involved in negotiating some of the terms of settlement with Mr. Haughey’s then agent, Mr. Desmond Traynor. The Tribunal has also sought information from Allied Irish Banks concerning the comparative treatment of other borrowers by whom large sums of money had been borrowed in or around the years 1979 to 1980 . Analysis of large borrowings by customers of the bank in or around this time shows that as a general rule the advancing of large sums of money, and in the case of non cooperate borrowers, was confined mainly to the agricultural sector. From the information available to the Tribunal there seems to have been no case in which the bank permitted borrowings of the order of Mr. Haughey’s borrowings unconnected with any investment such as the purchase of new land or the requirements of the agricultural sector for working capital. It will be recalled that at the Tribunal’s last public sittings evidence was given by Ms Sandra Kells of Guinness & Mahon Bankers, that a bank account was opened on the 11th of December, 1979, the day Mr. Haughey became leader of Fianna Fail, from which ultimately a sum of £750,000 was debited to fund a number of drafts which were used, it would appear, to discharge Mr. Haughey’s indebtedness to Allied Irish Banks. At the request of the Tribunal, Guinness & Mahon examined all documents retained by it on microfiche for the three month period from December 1979 to February 1980 with a view to endeavoring to identify documents which might be material to the sources of the various lodgements to that special account opened by Mr. Desmond Traynor. One of the documents which the bank has been able to identify is a copy statement of Guinness & Mahon’s own account with the Central Bank of Ireland. This type of statement records, amongst other things, transfers between different banks on their respective accounts held with the Central Bank. From searches carried out by Guinness & Mahon a document has come to light showing that on the 11th of December of 1979, the Guinness & Mahon account at the Central Bank records a debit of £150,000 which is particularised as being with reference to an account known as “Amien SL”. This would appear to signify that a sum of £150,000 was received by Guinness & Mahon for crediting an account in the bank held by Amiens Securities Limited. The particulars on the Central Bank account also referred to the transaction as involving what is described as “Rotunda Branch”. This appears to suggest that £150,000 was received from a bank having a branch at the Rotunda, and from inquiries carried out by the Tribunal, there would appear to be only one such bank, namely Bank of Ireland, Rotunda Branch. The Bank has also established that another transaction across the account of Guinness & Mahon at the Central Bank of Ireland may be of relevance. This occurred on the 24th of January 1980. The documents uncovered by inquiries carried out at the request of the Tribunal by Guinness & Mahon show that on the Guinness & Mahon account at the Central Bank, the following entry appears for the 24th of January, 1980 : “Cheques sent for Central Bank funds, account JD Traynor”. The date of this transaction matches the credit entry of £150,000, to the JD Traynor Special Account. The statements on that account have already been mentioned in evidence at the Tribunal’s last sittings. Therefore, while the Tribunal has been able, with the assistance of Guinness & Mahon, to locate a statement of account for the JD Traynor Special Account, from information now made available to the Tribunal, it would appear that the bank has been unable to locate any such statement of account for Amiens Securities Limited or for any other Amiens company for the month of December of 1979. This will be inquired into, as it appears to be unusual when it is borne in mind that account statements have been found for earlier years. As I have just indicated, from the Tribunal’s inquiries from the Central Bank, it has not proved possible to date to establish any connection between these movements across the account of Guinness & Mahon at the Central Bank with any person other than the late Mr. Desmond Traynor. The Tribunal has learned of arrangements entered into between Mr. and Mrs. Charles Haughey and the Gallagher Group, through Mr. Patrick Gallagher, in the beginning of 1980. As of yet, the Tribunal is not in a position to establish a connection between those arrangements, to which I will refer in detail in a moment, and the funding of Mr. Haughey’s settlement with Allied Irish Banks. However, the arrangement will be scrutinised at this stage because of its close temporal connection with the events and also because circumstances of the arrangement give rise to some questions as to whether it ought to be regarded as a payment to Mr. Haughey. It would appear that in or around the beginning of January of 1980, Mr. and Mrs. Haughey entered into an agreement to sell part of their lands at Abbeville Kinsealy to the Gallagher Group. This information has been provided to the Tribunal by Mr. Laurence Crowley, a chartered accountant, and formally a partner in Stokes Kennedy Crowley. Mr. Crowley has made this information available to the Tribunal as the person who was on the 30th of April, 1982, appointed Receiver over the assets of the Gallagher Group of companies. It would appear that under the agreement the Gallagher Group were to purchase from Mr. and Mrs. Haughey approximately 35 acres of land at Kinsealy, at a price of £35,000 per acre. This agreement was reduced into writing and was dated the 27th day of January, 1980. The agreement was signed by “P Gallagher” and it would appear that this is the signature of Mr. Patrick Gallagher who was then a director of the company. The agreement was witnessed by Mr. Paul Gallagher. The agreement had a number of unusual features, and it is these features which attracted the attention of the Tribunal and which have prompted the question whether the payment provided fell under the agreement amounting to a payment within the meaning of the Terms of Reference. Now I am putting the agreement up and I shall deal with it presently. I will just outline what appear to be the unusual features of the agreement which are as follows: Although the contract involved the sale of a substantial parcel of land for a total consideration of £1.225 million the agreement does not appear to have been prepared by a solicitor. Although it involved a substantial parcel of land and contained some unusual clauses, the agreement ran to only seven paragraphs and did not contain any of the usual conditions to be found in most contracts for the sale of land, which are almost invariably along the lines of the standard general conditions of sale of the Incorporated Law Society of Ireland. If I might pause there and just open the agreement. At paragraph 1: This agreement made between C J Haughey, Mrs. Maureen Haughey, Abbeville, Kinsealy, County Dublin, hereinafter called the vendor and the Gallagher Group Limited, Sean Lemass House, St. Stephen’s Green, Dublin 2, hereinafter called the purchaser. 2: Gallagher Group Limited have agreed to purchase the area identified and ringed in blue on the attached map of approximately 35 acres at £35,000 per acre. 3: The above agreement is subject to the condition that the purchaser will provide the vendors with a stud farm of at least sixty acres of land with appropriate stables and within a radius of twenty miles of the General Post Office, preferably in North County Dublin. The new stud farm and the cost thereof will have to be met with the approval of the vendors. The cost of the new stud farm will be deducted from the purchase price. 4: The transaction will be completed within six months of the vendors indicating in writing their approval of the new stud farm. The balance of the purchase price will be subject to interest at five points above the Associated Banks treble A rate for any period after the stipulated completion date during which completion is delayed. 5: A deposit of £300,000 has been received and is hereby acknowledged. The balance of the purchase price will be payable on the completion date. 6: In the event of the transaction not being completed before the 31st December 1985, the deposit of £300,000 will be non refundable but Gallagher Group Limited will then have no further obligation under this agreement. 7: Should the events set out at No.6 come into effect the vendors agree to grant the Gallagher Group Limited the rights of first refusal for a further period of two years from the 1st January, 1986 . And it is dated the 27th of January, 1980 . It is signed Charles Haughey and it is witnessed, it is signed Maureen Haughey and it is witnessed and it is signed P Gallagher and it is witnessed. What the Tribunal wishes to inquire into is that because of the unusual form of the agreement it appears even more curious when it is borne in mind that the land at £35,000 an acre was being sold without the benefit of planning permission and was in fact at the time in an area zoned for agricultural use. One of the conditions of the agreement was that the purchaser, namely the Gallagher Group, would provide Mr. and Mrs. Haughey with a stud farm of at 60 least acres of land, with appropriate stables within a radius of 20 miles of the General Post Office and preferably in the North County Dublin area. But the new stud farm and the cost thereof was to be met with the approval of the vendors. This provision appears to have left the vendors with an enormous degree of discretion as to how the agreement should be completed, as to whether it should be completed at all and the agreement contained no mechanism as to how any dispute between the parties over the satisfaction of this condition could be resolved. This would appear to be all the more unusual when it is borne in mind that the deposit under the agreement was to be non refundable in the event of the transaction not being completed. This deposit of £300,000, was acknowledged in the agreement as already having been received. It would appear to be a substantial deposit, and in a contract where the deposit was non refundable, amounted to nearly 25% of the total purchase price. From information available to the Tribunal it would appear that the more usual deposit in the contract for the sale of land of this size would be in the order of 10% of the total purchase price and usually refundable. From information provided to the Tribunal by the Receiver of the Gallagher Group, it would appear that there is no record in the Group’s files of any steps having been taken in furtherance of the agreement. In other words, the Group’s files appear to contain no record of letters by the Group or by the Group’s solicitor to Mr. and Mrs. Haughey, seeking to have the agreement enforced. Nor do the files contain any record of any attempt by Mr. and Mrs. Haughey to enforce the agreement by calling upon the purchaser to take any of the steps in the conditions. The contract for sale was never in fact completed, and therefore Mr. and Mrs. Haughey had received £300,000 which they were not obliged to refund; and were after the period stipulated in the contract released from any obligation to give any land to the Gallagher Group. Although this is something which will not be dealt with at this stage of the Tribunal’s public sittings, it should be mentioned that eventually the transaction was treated by the Revenue Commissioners as a gain by Mr. and Mrs. Haughey which, at the appropriate time, was subject to a charge to tax and that was paid. In an effort to enlarge on its understanding of this transaction the Tribunal, apart from communicating with Mr. and Mrs. Haughey’s solicitors, has also endeavored to make contact with Mr. Patrick Gallagher. The Tribunal has been in contact with solicitors acting for Mr. Gallagher, and whilst initially there didn’t seem to be a likelihood of procuring at this stage the attendance of Mr. Gallagher, it now appears that Mr. Gallagher may be available to give evidence. Until the Tribunal establishes whether Mr. Gallagher, is prepared to provide a statement and if so, to give notice of the statement and of its contents to affected persons, it would not be appropriate to say anything else at this stage in relation to the matter. Mr. Charles Haughey had a loan account with Agricultural Credit Corporation going back over a considerable number of years. Each year he borrowed a substantial sum in the bank in the form of what has come to be known as a “stocking loan”. This is a form of facility advanced each year by ACC to farmers, in Mr. Haughey’s case usually in the fall of the year, or in or about August or September. This type of loan was initially advanced to Mr. Haughey in the mid 1970’s and at the time one of the bank’s agricultural inspectors visited Mr. Haughey’s farm for the purpose of validating his farming activities. It would appear that there were no further validation of the farming activities from this day onwards, but this does not appear to be in anyway unusual. In the period under review in the Tribunal’s Terms of Reference Mr. Haughey took out a number of loans commencing on the 11th of September 1979 with a loan of £35,000 Mr. Haughey’s loans were paid off in or about August or September of each year, with two exceptions, to which reference will be made later, and in each such year a new loan was drawn down for a sum slightly in excess of the amount of the previous year’s loan together with the amount of interest due in respect of the previous year. By 1984 the amount of money being drawn down on Mr. Haughey had increased to £90,000. In 1985 that loan was not repaid but rather with the agreement of the Agricultural Credit Corporation the interest only was repaid. This amounted to £12,554.08. The loan was rolled over until the following year. Once again in the following year the loan was not repaid. The interest amounted to £15,901, and that was paid. The loan was rolled over and in the following year, in 1987, the loan together with the interest which had accrued due was discharged by payment of £105,000. That payment has already been referred to in the course of the evidence given and in the Report of the McCracken Tribunal. From that Report on page 44, it appears that on the 2nd of December, 1987, a draft of £105,000, was drawn on Amiens Investments Limited, a company owned and controlled by Mr. J Desmond Traynor, payable to Agricultural Credit Corporation. On the 3rd of December 1987 it appears that this draft was lodged with the Agricultural Credit Corporation and was applied by them to clear Mr. Haughey’s loan. The McCracken Tribunal concluded that this all appeared to have been done in anticipation of the receipt of funds from Mr. Bernard Dunne. Over the period between 1979 and 1987 Mr. Desmond Traynor and Mr. Haughey between them shared the management of this indebtedness in as much as Mr. Haughey made contact regularly with Agricultural Credit Corporation concerning the drawing down of the loans and the manner in which the loan would be secured. In each year the loans were repaid by accounts in the name of Mr. Traynor. Those accounts were reimbursed with the amounts used to pay Mr. Haughey’s loan by similar amounts from accounts in the name of Mr. Haughey. Mr. Haughey’s accounts were of course, in overdraft and on each occasion that these payments to Mr. Traynor’s accounts were drawn down, Mr. Haughey’s overdraft increased. Special arrangements were put in place at Mr. Haughey’s request to ensure the confidentiality of his dealing with the Agricultural Credit Corporation. From information made available to the Tribunal by Mr. Michael Culligan, the then Chief Executive of ACC, those arrangements were put in place as a result of a request to him by Mr. Haughey in the 1980s. Mr. Culligan did not regard the request as in anyway improper or unreasonable in the circumstances for a person of Mr. Haughey’s high profile, and he has informed the Tribunal that for the protection of the borrowings and accounts of senior management staff, the Agricultural Credit Corporation already provided internal confidentiality in order to deter unwelcomed curiosity or even malicious interest and a coding system was used whereby numbers as opposed to names were applied to the accounts of such persons. Mr. Haughey, however, appears to be the only person dealing with ACC other than it’s senior management, to whom this special type of confidentiality was applied. Borrowings from the ACC were usually secured, inter alia, by a form of chattel mortgage over the borrowers stock. In order to be effective, such a chattel mortgage had to be registered. Mr. Culligan has informed the Tribunal that around 1982, Mr. Haughey asked him not to register a chattel mortgage, which he had then executed, and according to Mr. Culligan this was because Mr. Haughey felt that it would make his private affairs open to media comment. The ACC’s Chief Executive thought that this request was understandable in view of Mr. Haughey’s good record of repayment and the sensitivity of his political position, and he felt that it was neither a part of, nor a breach of, ACC policy and that it was merely an appropriate use of a discretion in highly unusual circumstances. Mr. John Hickey, the retired Deputy Chief Executive of the ACC, and a person who was familiar with Mr. Haughey’s record of dealing with that bank, has provided information to the Tribunal and has also referred to the non registration of this chattel mortgage and with a number of subsequent chattel mortgages, but points out that the bank’s file discloses a pre-existing registered chattel mortgage for present and future advances. The question to be inquired into and which arises, is whether the granting of this indulgence to Mr. Haughey was in the nature of a benefit in kind, in as much as the bank’s borrowings were not secured, at least as far as Mr. Haughey was concerned, and perhaps as far as the law was concerned. I am now moving on to a different matter and a slightly new matter. It was dealt with in part in the last public sittings of the Tribunal and the question is of Mr. Bernard Dunne and the question of the lodgement of bearer cheques to a bank account at Guinness & Mahon. In the course of evidence given at the Tribunal’s last sittings, a number of queries were addressed to Mr. Bernard Dunne concerning the cheques known as the “bearer cheques”. Six of these “bearer cheques” in all were lodged to an Amiens Securities Limited account number 10407014, at Guinness & Mahon. The cheques were lodged on two separate days in two branches. The Tribunal was not in a position in the course of the evidence to ascertain how these cheques came to be lodged. Since that date the Tribunal has obtained further information from Mr. Dunne concerning the cheques, and it is his belief that there were only two persons who would have received “bearer cheques” in any of the amounts comprising either of the two lodgements or in an amount equal to the total of the six cheques. Mr. Bernard Dunne has informed the Tribunal that only he, Mr. Bernard Dunne himself, or Mr. Noel Fox, would have obtained “bearer cheques” in either of those amounts. He himself, is able to say that to the best of his recollection he did not make any lodgement of those cheques to the account of Guinness & Mahon, nor did he, as far as his recollection goes, hand those cheques to anyone who may have made such a lodgement. I should also say that Mr. Bernard Dunne has informed the Tribunal nor does he have any recollection of handing those cheques to Mr. Noel Fox. Turning now to what were referred to at the last public sittings of the Tribunal as the “Carlisle cheques”, that is the Dunnes Stores Grocery Account cheques which were routed through Carlisle Trust and eventually found their way somewhere else; in the course of the Tribunal’s last sittings evidence was given concerning three cheques drawn on a bank account of Dunnes Stores signed by Mr. Bernard Dunne, which were credited to an account of Carlisle Trust Limited and ultimately credited to an account of Celtic Helicopters on the one hand and a company known as Kentford on the other hand. The late Mr. Desmond Traynor was instrumental in channelling the three Dunnes Stores cheques through Carlisle Trust. In the course of evidence given at the Tribunal’s last sittings, Mr. Bernard Dunne indicated that he had a vague recollection that he may have given these cheques to Mr. John Barnicle. In his evidence Mr. John Barnicle stated that he did not receive the Carlisle cheques from Mr. Dunne. 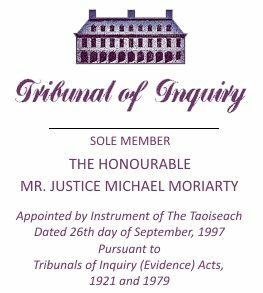 Since that date the Tribunal has been informed that in or about 1991, Mr. Bernard Dunne was approached by Mr. John Barnicle seeking the financial assistance of Mr. Bernard Dunne in connection with the purchase of, the proposed purchase by Ciaran Haughey and John Barnicle of a parcel of land at Dublin Airport. The financial assistance was provided by Mr. Dunne and ultimately the amount borrowed was repaid and the transaction was carried through in the ordinary way, along ordinary commercial lines. The Tribunal is of the view that this evidence should be adduced in order to complete the picture of the relationship between Mr. Bernard Dunne and Celtic Helicopters Directors, having regard to the features of the relationship referred to in the McCracken Tribunal report and the recollection, however vague, of Mr. Bernard Dunne and the additional features of their commercial relationship which has now come to light in the context of Mr. Dunne’s recent information. Turning now to Mr. Seamus Purcell and Celtic Helicopters: reference has already been made in an earlier outline statement and in the evidence given to the Tribunal of payments by Mr. Seamus Purcell to Celtic Helicopters. Mr. Purcell has provided the Tribunal with a Memorandum of Information in which he states that he was approached by a representative of Mr. Haughey in 1986 and 1987 to invest in Celtic Helicopters and that he gathered that an investment was being sought from a number of people at that time; he has informed the Tribunal that he agreed to make a payment of £12,000 and that he was asked to pay this sum to the late Mr. J Desmond Traynor. Mr. Purcell has informed the Tribunal that when he was asked to make the payment of £12,000 to Mr. Traynor, he knew Mr. Traynor, because he had had business dealings himself with Guinness & Mahon. As in the case of other persons contributing to Celtic Helicopters in or around the time of the setting up of the company, the Tribunal will wish to establish whether this was in the form of an indirect payment to Mr. Charles Haughey. Turning now to Mr. Mike Murphy and Mike Murphy Insurances and Celtic Helicopters. Mr. Mike Murphy, through his insurance company, was involved with Celtic Helicopters in a number of ways. He was firstly involved as the company’s insurance broker. He was also involved as a person through whom the company hoped to organise finances in 1992. He was, in addition, involved as the person by whom a cause of action which the company asserted it had assigned to Mr. Desmond Traynor was being processed. He was also involved with the company as the person by whom a loan for the payment of the company’s insurance premium was effectively repaid in 1992 and 1993. Mr. Mike Murphy has already given some evidence concerning the approaches by Mr. Barnicle, Managing Director of Celtic Helicopters, to him in 1992, concerning the company’s requirement for new investors. Mr. Murphy has already given evidence that he introduced, as an investor, a Mr. David Gresty. In addition to the evidence he has already given, he has also provided further information to the Tribunal and has informed the Tribunal that in September of 1992 he inquired from Mr. David Gresty as to whether he was interested in investing in Celtic Helicopters; that Mr. Gresty agreed to the investment and that he directed Mr. Murphy to procure the investment for him, and to pay for the same from monies held by Mr. Murphy on Mr. Gresty’s behalf. Mr. Murphy has already informed the Tribunal that he was to hold the shares obtained on foot of the investment in trust for Mr. David Gresty. Evidence was given that an investment consisting of a cheque from the Carlisle Trust in the sum of £100,000 was paid into an account of Celtic Helicopters and at the time Celtic Helicopters were under the impression that this represented the investment of Mr. Murphy. Mr. Murphy has informed the Tribunal that he was not aware that his cheque for the sum of £100,000 sent to Credit Suisse in London was used to fund an Ansbacher account held for the benefit of Mr. Charles Haughey. So far as his dealings with Mr. Gresty were concerned Mr. Murphy has informed the Tribunal that he indicated to Mr. Gresty that for a sum of £100,000 he could acquire 8% of the company, that he was happy that the company could trade out of its position, and that it had potential, due to contacts, to obtain air/sea rescue contracts and potentially other State contracts. He says, that having made clear to Mr. Gresty the status of the company as he knew it, he, Mr. Gresty, was happy to proceed with the investment as Mr. Murphy had arranged it. He has also informed the Tribunal that he made a commercial decision that under no circumstances did he want to be known as the person responsible for the collapse of Celtic Helicopters and that this was due to its obvious association with Mr. Charles J. Haughey. He says, that it was for this reason and primarily for this reason alone, that he assisted the company with the payment of their insurance premium, but he has also said that it was an important factor in his mind when discussing the matter of investment with Mr. Gresty. He, in addition, has informed the Tribunal, that he Mr. Murphy, guaranteed that Mr. Gresty would not be at a loss as a result of his investment. From information made available to the Tribunal, Mr. Murphy has indicated that he provided finances to Celtic Helicopters, to enable it to pay its premiums in respect of aviation insurance in 1992/1993. He says that he did this primarily so as to avoid the collapse of the company. His information to the Tribunal is to the effect that the sums collectively loaned by him to Celtic Helicopters have been substantially repaid. The Tribunal will nevertheless wish to examine these statements in evidence with a view to ascertaining whether Mr. Murphy directly provided benefit to Celtic Helicopters and indirectly to Mr. Charles Haughey by financing the insurance premiums of the company and whether or not this has now been repaid in full, and further by guaranteeing a third party investment in the company. The public and the press should be aware that this is merely an opening or outline statement. It is not evidence. The matters referred to must be examined in evidence and only then will they have a status.